Can Physiotherapy Help Diabetic Patients? | Dynamic Physiotherapy & Sports Injury Clinic Inc.
Can Physiotherapy Help Diabetic Patients? Diabetes affects millions of people around the world. Factors such as poor nutrition and obesity contribute to these rising rates. There are many treatment approaches that are currently used to treat diabetes. But can physiotherapy help diabetic patients? Exercise is a primary component of the work that physiotherapists do with their clients. 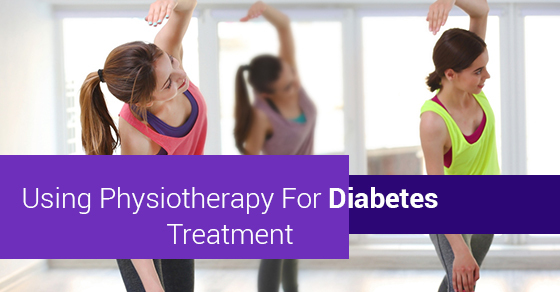 As a result, physiotherapy can be an invaluable tool in helping manage diabetes and other health conditions. Diabetes is a disorder related to the body’s metabolism. Its primary characteristic is a high level of blood sugar that results from the inability to properly use or produce insulin. In Type 1 diabetes, a person is unable to produce the insulin needed to transport glucose (sugar) from the blood and into the cells. Type 2 diabetes involves the body’s inability to respond to the insulin that is present, which prevents the uptake of glucose by the cells and leads to a significantly high level of blood sugar. In addition to high blood sugar, diabetes results in damage to the nervous system and dysfunction of the body’s circulatory system. Although there is currently no cure for diabetes, the condition can be managed through the use of nutrition, exercise, and lifestyle strategies. Two effective ways to manage diabetes are nutrition and exercise. Physical activity helps patients manage their weight, decrease LDL (low-density lipoprotein) cholesterol while increasing HDL (high-density lipoprotein) cholesterol in the body. Exercise is also essential for maintaining metabolically active muscle mass while reducing unwanted body fat. This contributes to the treatment of high blood pressure and the management of stress. Exercise can also help patients reduce their need for medications or insulin while preventing the risk of cardiovascular disease. Physiotherapists have extensive knowledge and skills in the prescription of exercises that are based on the needs of each person. This makes them invaluable members of any team dedicated to helping patients manage diabetes. Your physiotherapist can also track your ongoing progress to ensure that you get the maximum results from your exercise program. The best results in managing diabetes come from a combination of resistance and aerobic exercises. Aerobic exercise is effective in strengthening the heart and respiratory capacity. It burns stored calories to help reduce unwanted fat. Resistance exercises strengthen the muscles and bones. It increases the body’s metabolic rate over time and can contribute to the control of your blood sugar. Physiotherapy treatments contribute to the prevention of the complications that can occur in diabetic patients. Those patients who are at risk can benefit from the involvement of their physiotherapist in developing the programs that support their goals. By understanding how exercise and nutrition affect blood sugar regulation, you and your physiotherapist can develop an exercise program that supports your long-term health. © 2019 Rehab Services, Massage Therapy & Acupuncture Treatment - Dynamicphysiotherapy.ca. All Rights Reserved.